I did not include amounts for the ingredients because it’s really up to your tastes and how much vegetable/noodle ratio you prefer. These particular vegetables coupled with the grilled plums are fabulous for flavor, color and texture with the barbecue sauce. Put a large pot of water on the stove to boil. If you have dry udon noodles then cook them, if you are using pre-cooked, then use the water to warm them. Heat a grill pan on medium high and place the plum wedges and broccoli planks in the pan. Cook on each side until you have caramelized grill marks. Remove to a plate and set aside. Drizzle some canola in a large wok-style pan and turn heat on medium high. Stir-fry up the carrots and celery and then add the kale. Cook until softened but still vibrantly green. Add barbecue sauce to the cooked and drained noodles and mix well. Toss the noodles with the carrots, celery and kale. 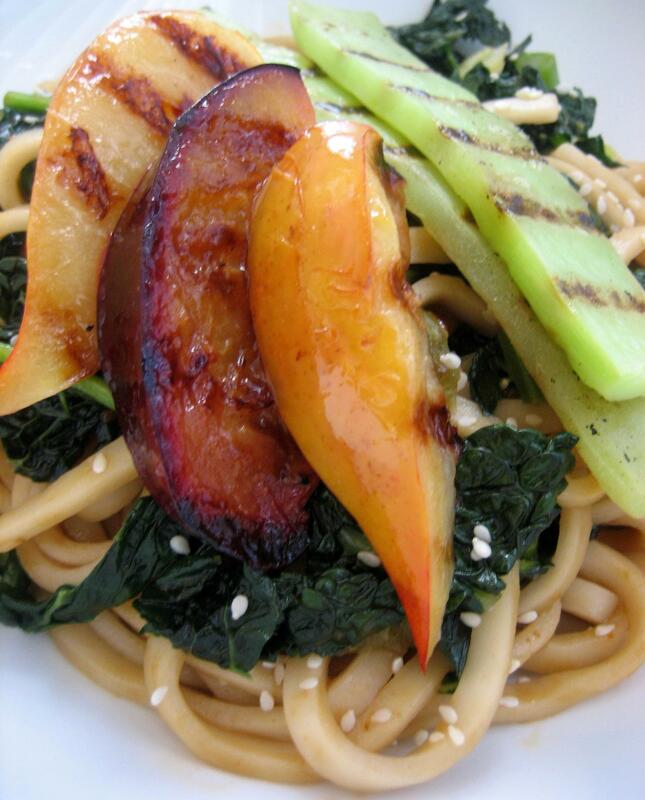 Serve garnished with the grilled plums and broccoli stalks and sprinkle with sesame seeds.